According DeTomaso archive made DeTomaso only 25 genuine GR3 Pantera! DeTomaso has made only 25 GR3 Pantera the real "born as" GR3. 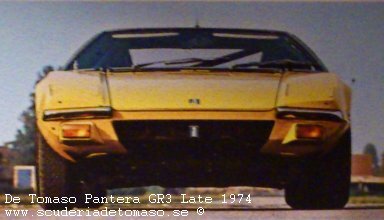 They also tranformd ordinary Pantera (L, GTS) to GR3 specifications. Click on transformed button and read more about the Pantera DeTomaso transformed to GR3! DeTomaso made 25 GR3 Pantera! Red 1972 Provini Tarquinio Italy more info! Yellow 1973 Germany more info! Orange 1973 Odoardo Govoni Italy more info! Red 1973 Franco Britannic Frence more info! Light Blue 1973 Trenti Italy more info! Green 1972 Franco Britannic France Stolen in Paris 1974 never found! Red 1973 Veneta Sport Car Italy more info! Yellow 1973 Veneta Sport Car Italy more info! Red 1973 Modena Sport Car Switzerland more info! Yellow 1973 Franco Britannic France more info! Red 1973 Wicky* Switzerland more info! Yellow 1973 Wicky* Switzerland more info! Yellow 1973 Italimport Germany more info! Yellow 1974 Wicky Switzerland more info! Red 1973 Italimport* Germany more info! Red 1974 Leasing International Italy more info! White 1974 Claude Duboris Belgium more info! Yellow 1974 Claude Duboris Belgium more info! Red 1975 Walter Friedrich Switzerland & more info! White 1975 PRO Comet Srl Milano Italy more info! Yellow 1976 Automobil Vertriebs Germany more info! same as the earlier chassis? more info! That gives us 25 genuine GR3 Pantera! If you see something wrong with this list,please let me know! New info on #7395 in Italy! Updated GR3 list. Pantera #4831 is moved to tranformd to GR3 because of typing error. New info on (tranformd to GR3) Pantera #1070! Pantera #4831 is moved to tranformd to GR3 because of typing error. More owners and more info of #7395 in Italy! New photo #7395 in Autosprint May 1975! More owners of #7395 in Sweden! New info on (tranformd to GR3) Pantera #1070 and #7400! Almost all text is new! Do you want to be seen with a car that is guaranteed turn heads? A real European Hill Climb Champion!! If you are interested, do not hesitate to contact us! With Marco Capoferri in 1975! If you know anything about! European Championship for Grand Touring Cars 1975. European Hill Climb Championship 1975. Italy Championship for Grand Touring Cars 1975.